While Whitney Houston struggles to hit once-familiar notes on her critically wobbly European tour, her biggest fan -- Taiwanese singer Lin Yu-chun -- is riding high this week after inking a major label record deal. 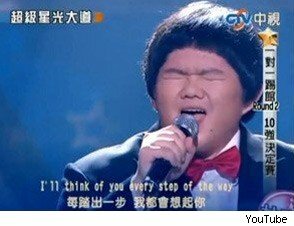 Sony Music said in a statement Thursday that Lin, the bowl cut-sporting singer whose rendition of 'I Will Always Love' on a TV talent show made him a star just a month ago, will release an album of Chinese and English songs in July. "I still can't believe this is real," the 24-year-old singer says in the statement. He told the AP recently that the show gave him "more confidence" to pursue a music career, in spite of his unconventional appearance. "You don't have to be a good-looking man or woman to succeed," he said. "Just be yourself and try your best." Lin has said he suffered from a lack of self-confidence because of his weight. "Being fat draws a lot of mockery in our society," he said. 0diggsdigg To cope with the pain caused by jokes from peers, he locked himself in his room and sang along to songs by Celine Dion and Mariah Carey. But it was Houston's signature track, from the soundtrack to the 1992 film 'The Bodyguard,' that gave him the confidence to keep trekking on. "I played it again and again even though my parents couldn't stand it anymore and asked me to stop," Lin said.